"I made this last night, and WOW it was delicious. I actually made it for a breakfast dish one time, and I think it's perfect for that as well." Preheat oven to 350 degrees F (175 degrees C). Prepare a 9x5-inch loaf pan with cooking spray. Pour melted butter into a small bowl. Dip each piece of biscuit dough in melted butter to coat. Arrange enough of the biscuit dough pieces in the bottom of the loaf pan to form a single layer; top with 1/2 cup Cheddar cheese, 1/4 cup pepper slices, and 1/4 teaspoon parsley. Repeat layering once and top with remaining biscuit dough pieces, pepper slices, and parsley flakes. Mix remaining 1/4 cup Cheddar cheese and mozzarella cheese together in a bowl; spread over the top of the ingredients to cover. Bake in preheated oven until golden brown, 40 to 45 minutes. Cool bread in pan for 5 minutes before inverting onto a plate to serve. This was OK...as one reviewer mentioned, too dry. And I added more cheese in hopes it would alleviate the dry factor but it fell short. Nice recipe, I really like this. I followed advice to cut in to eights, not quarters and tossed them in a bowl full of melted butter. Combinations of fillers are endless. This was really good. I made some modifications to suit what I had - made my own biscuits, used cheddar and cotija cheeses, and cilantro instead of parsley. Will make again for sure! My family loves this and it is so quick to make. 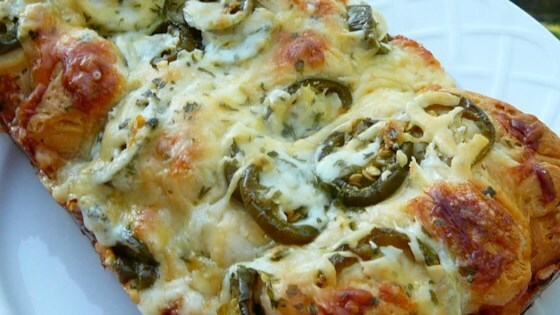 I use Marzetti's "tamed" jalapenos (drained) which are wonderful. This goes great with a brothy soup on a cold day. Love it! I added some crumbled hot sausage, (about 1/2 lb). It was done in 30 min. I'll be making this again. Cooking time was about 40 mins.